When it comes to live music, New York, New York is arguably the greatest city in the world. The Five Boroughs doesn't have a few places to listen to live music, it literally has hundreds. Creating a list of the 55 best live music venues in New York City was an arduous, lengthy, and rewarding task. There are so many great places in The Empire City that no matter how long you make your list, you're bound to leave a few good ones in the dust bin. To shrink New York's vast selection of music venues to 55, we used three main criteria. The first was that the venue needed to have a serious passion for live music. The space didn't have to be an exclusive live music venue. It could also be a bar, or restaurant, or both. Also, the space didn't necessarily have to be dedicated to live music, it could also feature theatre productions, films, and dance recitals. Regardless of its use, the passion for live music had to be there. The venue needed to be a destination for music lovers. Finally, the venue had to be in New York City. It had to have a New York address. Sorry New Jersey. Let's begin our tour. You'll find the Lehman Center for the Performing Arts on the campus of Lehman College. The 2,310-seat concert hall was founded in 1980 for a noble purpose. It was founded to provide the community with affordable world class art, including a wide range of music performances. 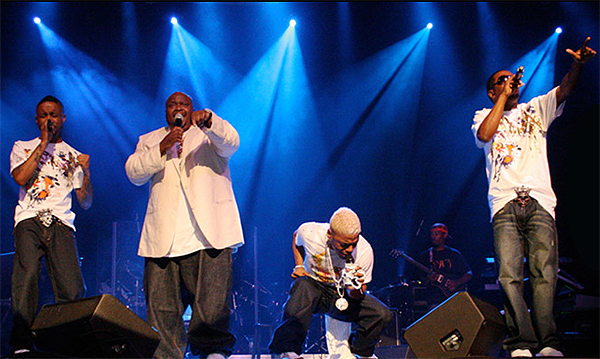 Dru Hill & Jon B and Kenny Lattimore live at the Lehman Center. Image taken from establishment's Facebook page.. Situated on Brooklyn's South Slope, Barbès is a neighborhood operation offering live music and a great selection of single malt scotch. 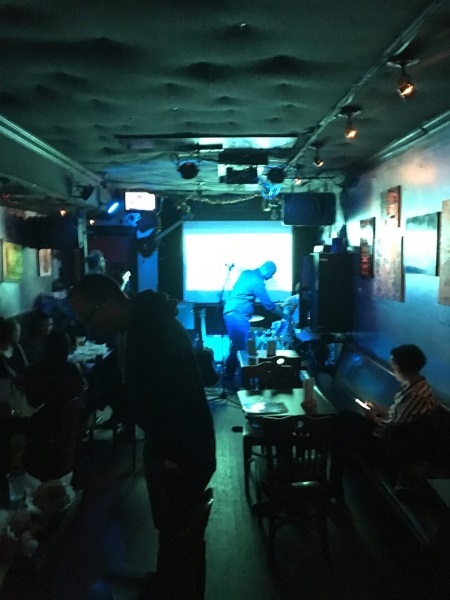 There's a lot to like about Barbès including the varied musical acts they schedule for their intimate stage, which you'll find in their back room. We'll admit that the award-winning Bushwick Starr caters to actors more than it caters to amps, but it's such a great space, and it's curated by such a great organization, that we couldn't exclude it. Founder Sue Kessler and her team work hard to bring mind-blowing performance artists to Bushwick. If you get the chance to visit the Starr, make sure you do it. Don Pedro may have the best vibe of any venue in the city. It's a great place to hang out and enjoy live music, a movie, or the big game. Get this: every day from 4pm to 9pm they have Bud Drafts for $2. Sign us up. As for live music, they book everything. One night it might be a jazz trio while the next it's a punk band. Freddy's Bar is one of the most praised establishments on our list. “The Gray Lady” calls Freddy's “the perfect neighborhood bar.” When you have free shows, inexpensive beer, and everyone inside treats you like a pal, you're going to get high praises. By the way, the films shown around the bar are created by co-owner Donald O'Finn. Freddy's Bar in Brooklyn. Image taken from establishment's Facebook page. The Jalopy Theatre and School of Music offers live music six days a week. Their focus is generally folk music, of the local and global varieties. The interesting thing about the Jalopy is it's also a school. They'll teach you how to play an instrument. Don't have one? No problem, they'll sell you one. Kings Theatre opened in 1929. Then it fell into disrepair. Nonetheless, city leaders rallied and renovated the venue to its original design to the tune of $95 million. Today, it's a cultural cornerstone, attracting big-name musicians to the Flatbush community. The performance hall is jaw-dropping gorgeous. It's as ornate as the day is long. Although the name is confusing, what goes down at Live at Shea Stadium is simple. During the day, Live at Shea is a recording studio and rehearsal space. Then at night, it turns into a live performance venue. All live performances are recorded (archived). They are later remixed and remastered but not so much that the energy of the performance is destroyed. Then, they are released on the venue's website. The Living Gallery is about passion, action, and dreams. It's a place to collaborate, not to compete. It's basically an art gallery that doubles as a performance space. Nyssa Frank founded The Living Gallery in 2012. Since that time, it has grown into a dynamic and daring destination for artists and art followers. In addition to live music, this remarkable creative platform offers classes, lectures, and workshops. The Sewer Gators performing at The Living Gallery. Image taken from establishment's Facebook page. Sufjan Stevens, Regina Spektor, Duncan Sheik, Beth Orton, and Norah Jones have all played Pete's Candy Store. Orton holds the honor of playing the very first show at this Williamsburg institution. That list of names is impressive when you consider Pete's is a small local tavern. Pete's has been building its amazing reputation since its opening in 1999. Owners and operators Justin Scurti, Arthur Shepherd and George Souleidis have done more than create an engaging heavy metal bar. They've created a neighborhood meeting place and a first class music venue that just happens to book heavy metal acts. The establishment is named after a Black Sabbath song. We love their big mahogany bar. 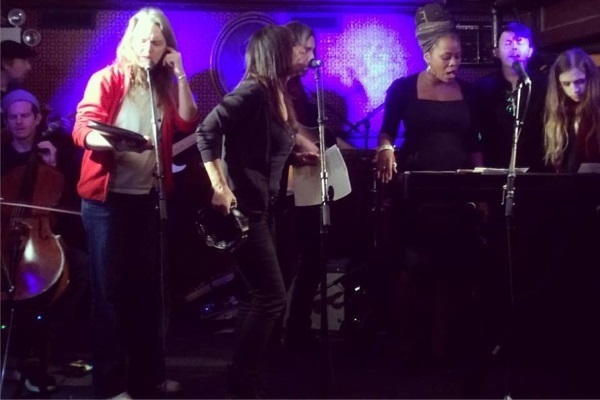 Patti Smith tribute night at Union Hall. Image taken from establishment's Facebook page. Proprietor Andy Heidel has managed to combine two divergent things into one place. Those things are live music and science fiction. The Way Station hosts live music acts five nights a week. These acts range from bluegrass to Indie-rock. Heidel also screens sci-fi movies and Dr. Who episodes. His awesome bar has a life-sized replica of the Doctor's blue police box. Paul McCartney, Stevie Wonder, and Carlos Santana have all played the Highline Ballroom. That's impressive for a performance space that accommodates 700 standing or 400 seated. Big names flock to the Highline because they can do an intimate set without losing the production values of their stadium shows. You don't attend a show at The Kitchen expecting the artist to appear on next week's episode of The Voice. The Kitchen is all about artists who experiment and shape our cultural landscape. One of the oldest nonprofit spaces in NYC, The Kitchen is internationally known for being on the vanguard of the performing arts. Don't worry. Slake only sounds like a bad word. It means “quench or satisfy one's thirst.” You'll certainly do that at Slake. The venue boasts three levels and can host 500 for a live concert. Despite its size, it's quite cozy. Slake has a pristine sound system and huge art installations. You come here, not to be judged, but to get slaked. Apothéke frequently hosts live music, generally in the form of jazz, but that's not the only show in the establishment. Receiving equal billing are Apothéke's astonishing cocktails. Proprietors Heather Tierney and Christopher Tierney (sister and brother) have used exotic herbs and fruits to turn their cocktails into works of art. One more thing about Apothéke, it's situated on a hidden street. How mysterious. Apothéke's five-year anniversary party. Image taken from establishment's Facebook page. The Bowery Electric delivers live bands every night of the week. What type of music will you hear at The Bowery Electric? It's easier to list the genres you won't hear. The Bowery Electric has drinks named after songs by The Ramones (“I Wanna Be Sedated”), Iggy Pop (“Lust for Life”), and The Misfits (“Teenagers from Mars”). Grab a “New Kind of Kick” (The Cramps) and meet us in the Vault Room. Juke Bar, located downstairs on 196 2nd Avenue, offers live jazz every Sunday from 7pm to 10pm. While you'll there, enjoy some stuffed pretzel balls. Speaking of food, they don't mind if you bring your own. They have a robust selection of brews and a very nice cocktail menu, try London's Calling. Otto's Shrunken Head is winner for the best name on our list, and they sell some of the coolest swag. We want the Fu Manchu mug. 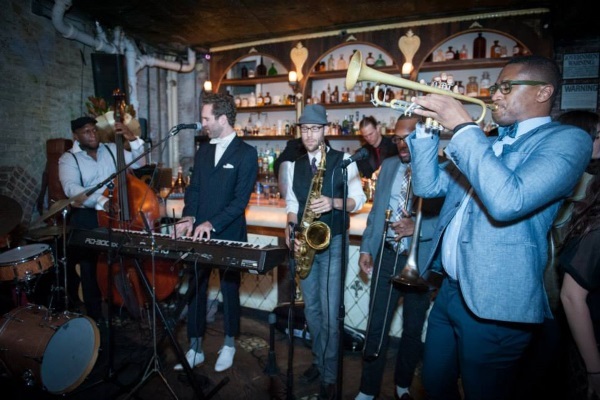 Otto's uses diverse live bands, killer DJs, and rum-based concoctions to bring the laidback vibe of the South Pacific islands to the rather uptight isle of Manhattan. They also have a monthly live-band karaoke night. Webster Hall boasts that it's “America's first nightclub.” They can make that claim because they've been in business since 1886! Now, just because they're well over 100 years old doesn't mean their acts are tired and stale. Webster books fresh and dynamic musicians, and their annual parties, like their Halloween bash, “Webster Hell,” are legendary. 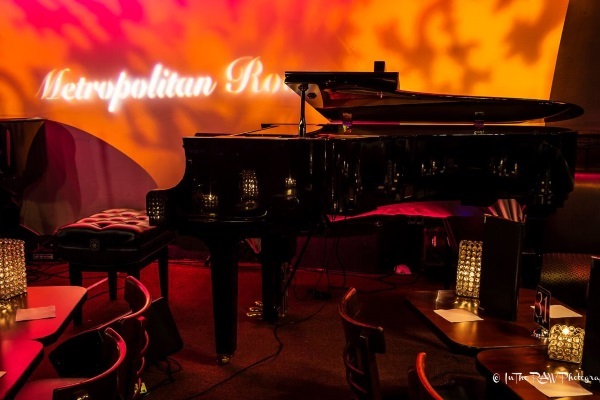 The Metropolitan Room is an award-winning, high-end jazz club and cabaret. It seats 115 and its stage welcomes both household names and rising young talent. Not only is The Metropolitan Room one of the most important music venues in the Big Apple, it's also one of the most exciting. Not too many music venues have joie de vivre. The Metropolitan Room is located at 34 West 22nd Street. Image taken from establishment's Facebook page. You've gotta love a bar that says its “heart is jazz and its soul is the blues.” The musicians that play the 55 Bar run the gamut from established icons to wunderkinds. The bar's staff is attentive, courteous, and always smiling. If the stage is empty, then spin some tunes on their awesome jukebox. If you're in the village, this is the place to hang out. Caffè Vivaldi is named after a classical composer, and pictures of other classical composers line the wall. At Caffè Vivaldi, you're likely to hear that kind of music as well as jazz and folk. Occasionally, management will host an open mic night. Beyond music, they have an enchanting menu and the atmosphere is quintessentially Greenwich Village. 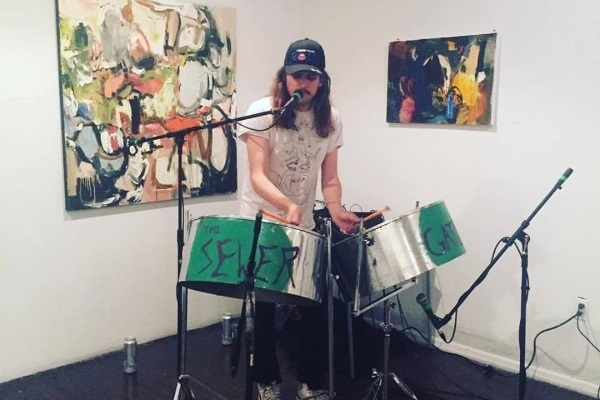 Taking up 6,700 square feet of real estate on Bleecker Street, Carroll Place hosts exciting live acts in its cozy Music Room. They also serve mouthwatering food and refreshing cocktails. Carroll Place is the labor of love of brothers Mario and Sergio Riva, and their partner AJ Bontempo. They've created a very special journey's end for the village. Founded on historic Village Gate, (Le) Poisson Rouge is all about creating a place for both the artist and the audience. They can accommodate anywhere between 250 and 700 patrons. Their state-of-the-art performance space can be configured in numerous ways, including in-the-round. Whether it's music, film, dance, or theater, you can trust LPR to provide quality revelry that has substance. 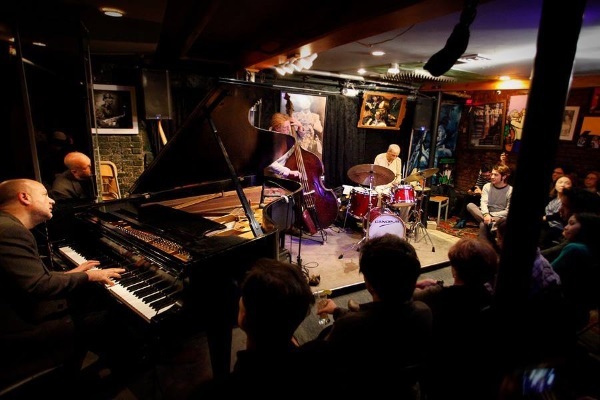 Smalls Jazz Club has a long history, but all you need to know is it's one of the world's top jazz clubs. That's right, the “world's.” Mitch Borden and Spike Wilner run Smalls with aplomb. Their music venue attracts people from all over the globe. 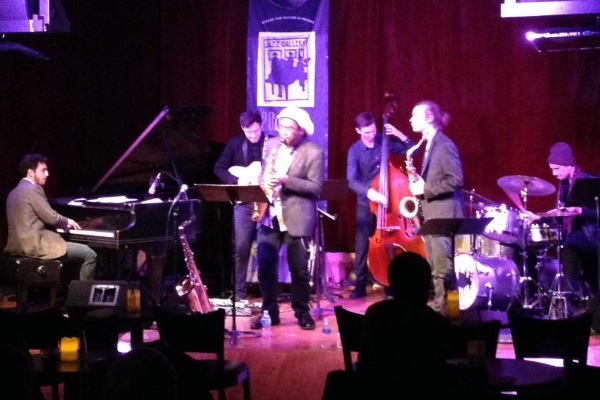 They come to Smalls because it's a proving ground for jazz artists. If you can't make it to Smalls just log onto their website and stream their live shows. Musicians playing at Smalls Jazz Club. Image taken from establishment's Facebook page. The Village Vanguard is an institution. Max Gordon opened the establishment in 1935. In 1957, it turned into an all jazz club. John Coltrane, Sonny Rollins, Bill Evans, and Wynton Marsalis have all recorded albums at this famous joint. Max' widow, Lorraine Gordon, now runs the club. Minton's Harlem is the birthplace of bebop. It's also a music venue that can say it's seen Charlie Parker, Thelonious Monk, Dizzy Gillespie, Louis Armstrong, and a slew of other jazz greats. Basically, Minton's is cool. They host live music every Friday, Saturday, and Sunday. Most of the time there's no music charge. Harlem Stage provides artistic freedom for contemporary artists of color and champions the neighborhood's cultural legacy. Diverse styles of music are performed at Harlem Stage and organizers encourage new collaborations and special tributes. This is a great place to introduce your children to the magic of live music. Visit The Iridium on a Monday. That's when they honor legendary guitarist Les Paul, who played the Iridium every Monday night from 1996 to 2009. Greats like Jeff Beck and Steve Miller have popped in to pay their respects and lay down some killer licks. 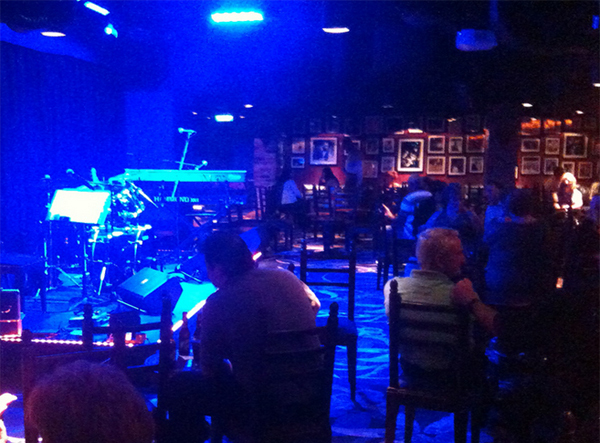 The Iridium's acoustics are marvelous and their tables have exceptional sight lines. Jazz By 5 performing at The Iridium. Image taken from establishment's Facebook page. Park Avenue Armory is a unique venue. It was, after all, home of the seventh regiment. The Armory is smearing the lines separating pop culture from high art. It does so by providing a space for works that can't be performed in traditional concert halls. Be warned, the armory is breathtaking. Arrive early so you can take in the architecture before the show starts. Burgeoning bands play Cake Shop's basement stage. Despite its diminutive nature, the performance space has first-rate acoustics. As the name suggests, you can get sweets here as well as a good cup of coffee. A record shop is found in the back and it sells albums cut by bands that once rocked their dais. The Cake Shop came out of the oven in 2005. So, here's the layout of The Delancey. It has three levels. You enter via the middle level. This is where you'll find their long bar illumined by a candlelit ceiling. Go down a level to their music venue. It's equipped for both live music and DJs. The top level is where you'll find their all-weather rooftop garden. It offers visitors a view of the Williamsburg Bridge. Performance space of The Delancey. Image taken from establishment's Facebook page. Pianos has two performance spaces: The Showroom and The Upstairs Lounge. It's common for both to host acts. So, you'll have your pick. You'll also get to pick from their delicious food and cocktail menus. Here's even more good news: their drinks are stiff. Pianos reserves prominent and up-and-coming acts in a variety of genres. Get to Rockwood Music Hall early and wear comfortable shoes. It can only squeeze 330 music devotees between its walls and a lot of them must stand. You'll endure the cramp quarters because Rockwood Music Hall is one of the best live music venues in the city, bar none. It's intimate, relaxed, and has a nice selection of wine. If you're in NYC, it will be worth your time to check out Rockwood. You know you've made it as musician if you get to play Madison Square Garden. Yet, MSG is more than just its reputation and the go-to-arena in the ipso facto cultural capital of the world. It's a superb music, sports, and live events arena. Sure, the food is expensive (and the beers! ), but regardless of who you see at the Garden, you'll have an amazing experience. 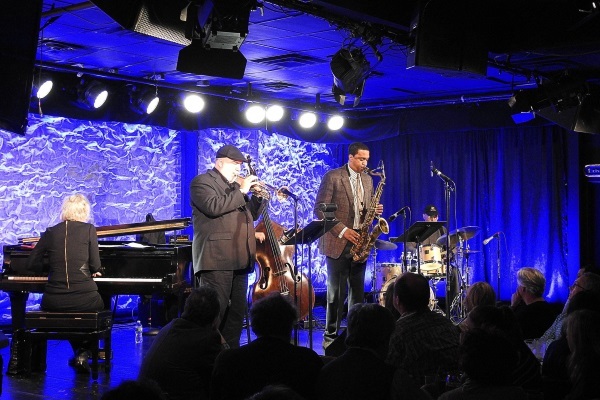 Founded in 1995, The Jazz Gallery is all about performance. This world renowned, and award-winning venue helps to nurture the next generation of professional jazz musicians. Artists come here to jam with their peers and perform in front of an enthusiastic and appreciative audience. No need for a babysitter. Since they don't serve alcohol, children are welcome. Patrick Bartley Dreamweaver Society performing at The Jazz Gallery. Image taken from establishment's Facebook page. “L.I.C.” stands for Long Island City, the westernmost neighborhood in Queens. The L.I.C. Bar has been in existence for a L.O.N.G time. The bar opened in 1929! Inside you'll find a gorgeous antique wood bar, tin ceilings, brick walls, and of course, their famous outdoor garden. This is an unpretentious oasis where you can listen to local musicians, enjoy a single-malt scotch, and hang with your crew. Terraza takes the “community center” of their description seriously. Freddy Castiblanco has worked hard to create a welcoming place where people of all cultures can hangout and not only exchange ideas, but enjoy scintillating music—all while imbibing a mixed drink. If there's no music planned, Terraza will enlighten patrons with some other culturally-rich art form. Music is yet another dish that pairs well with wine. That's sort of the idea behind City Winery. In other words, you come here to enjoy vino and live music. City Winery asserts that it's “New York's only fully functioning winery and music club.” They also have an amazing food menu meaning you should visit even when there's no live music. 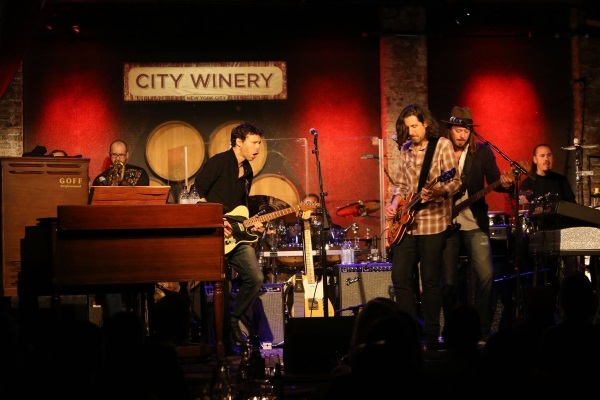 The Gregg Allman band (without Gregg Allman) performing at City Winery. Image by Al Pereira and taken from establishment's Facebook page. Session 73's general manager Ryan Morrissey books live music seven nights a week. He also makes sure that his patrons have remarkable dishes and ample cocktails to choose from. Session 73 is one of those unique establishments that's perfect for drinks with co-workers and drinks with a date. It makes us smile that there's a bar named Prohibition. Of course, what really makes us smile is visiting Prohibition. There's something for everyone there including Prohibition-era cocktails. As for live music, Prohibition raises their proverbial curtain just about every night. On Mondays, Prohibition hosts Metropolis' best open mic night. You might think Radio City Music Hall is famous because its old (it opened in 1932), it's in New York, and it has an iconic marquee. Well, this music venue could have opened last year in Iowa with no façade and it would still be an incredible performance space. The acoustics, sight lines, and staff are all out of this world. The seats are comfortable, the interior is beautiful, and The Rockettes are a kick. Known the world over, Arthur's Tavern entertains “The City That Never Sleeps” with the world's best jazz and blues musicians. While we're at it, let's also throw in some of the world's best rhythm and blues and Dixieland jazz acts. 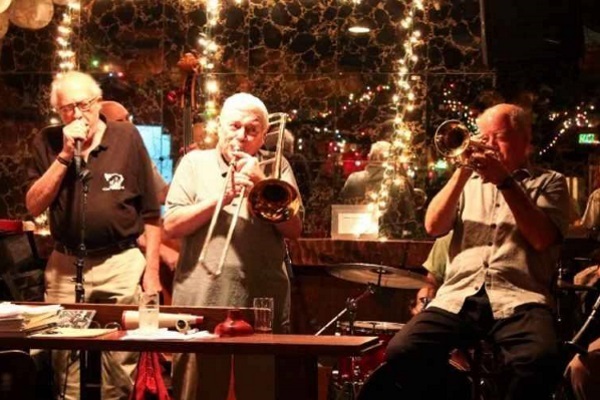 Quick aside, Arthur's has hosted the same Dixieland jazz band for 35 years. Order a drink and then sit at their piano bar or plop down at one of their intimate tables. The Grove Street Stompers performing at Arthur's Tavern. Image taken from establishment's Facebook page. The Duplex opened in the 1950s and has been at its current location since the 1980s. It bills itself as Gotham's oldest cabaret theatre. It's a locale where you can go to enjoy Broadway-caliber entertainment without paying Broadway prices. Downstairs is their famous piano bar. Upstairs is their famous cabaret.